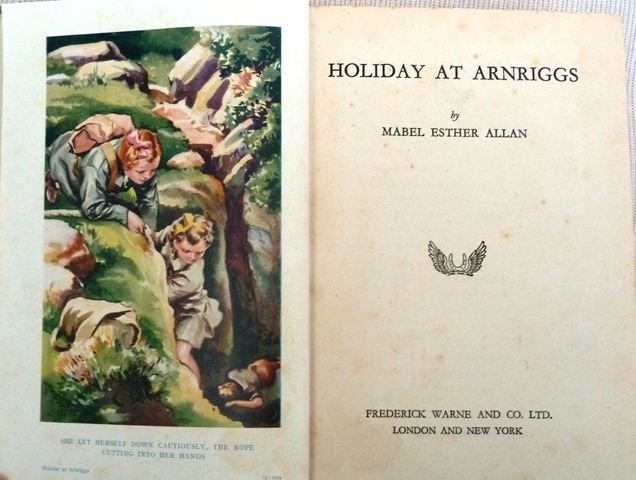 Since writing about Holiday at Arnriggs, I have found two short stories connected to the book, and have written about them at the end of the post, here. I have also managed to find a copy of The Adventurous Summer at last, and have updated my post about it. 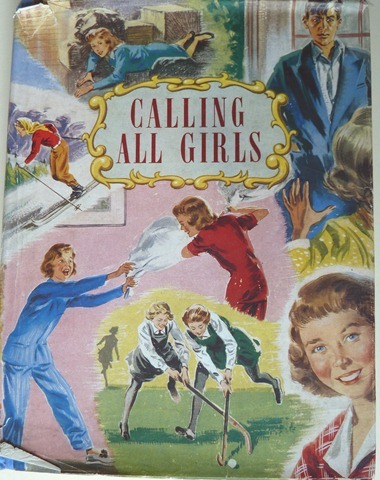 Holiday at Arnriggs was published by Warne in 1949, with a charming dustjacket showing Marian finding the swords on the front cover, and the boys dancing on the spine. 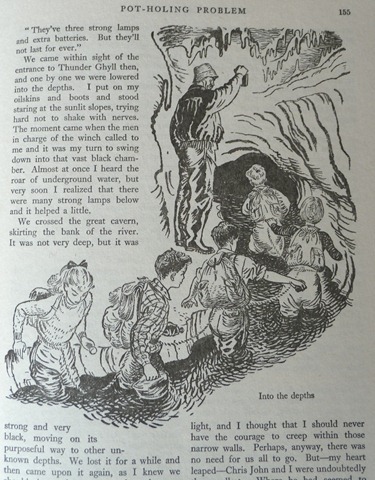 There is also a colour frontispiece showing Jan and Marian rescuing Will from the cavern (the artist is uncredited). There are no other illustrations. …Arnriggs was really written for the North Skelton dance. I many times saw a real men’s team, but I did that longsword dance myself for years, in a splendid team. I knew that dance with my whole self, and most of the other longsword dances of Yorkshire. 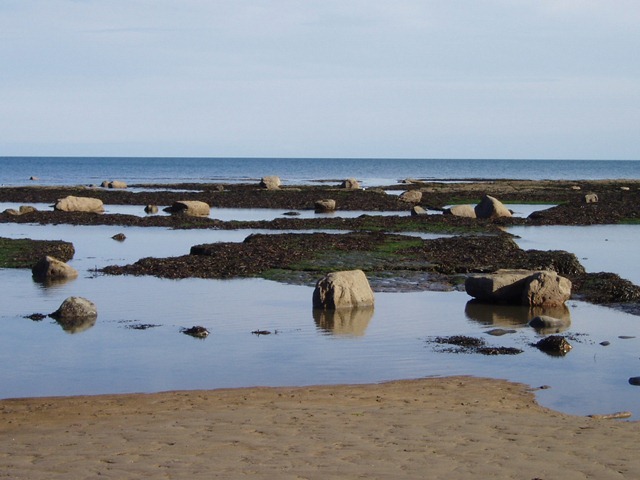 The story opens in Robin Hood’s Bay, on the North Yorkshire coast. Dreamy Marian is on a rock on the shore, reading her latest treasure, a book of Emily Bronte’s poems, and hasn’t realised that the tide has come in and cut her off. She has to be rescued by a local boatman. She goes up to the top of the village, and meets a car full of her aunt, uncle and four cousins, who she hasn’t met since she was small. She is horrified as the rest of her family are out, but she takes them back to their cottage and entertains them until her mother and brothers return from a day out in Whitby. 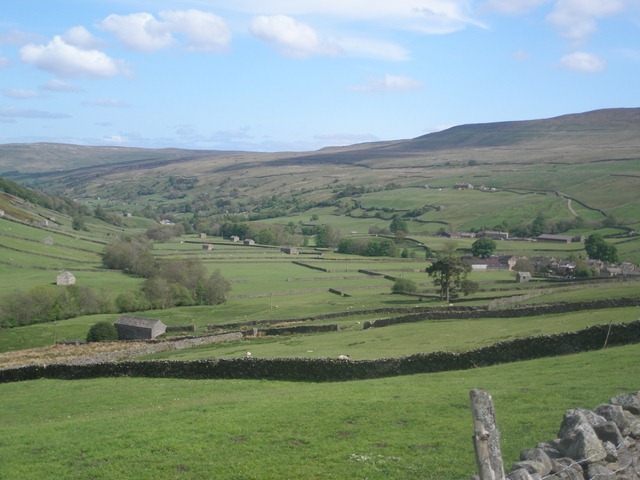 Her aunt explains that they have just moved from Bradford to a farm in the Yorkshire Dales, and proposes that Marian and her two brothers spend their summer holidays with them there. Marian is very upset by this proposal, being a solitary child, but she is overridden and they set off a couple of days later. Her parents are poor and take in summer visitors, the absence of the children mean that they will be able to have more visitors. 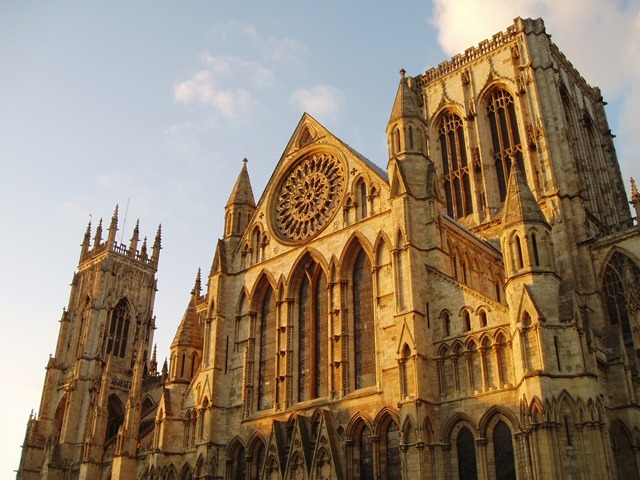 The children take the train to York where their uncle meets them in his car, and drives them to the farm. Marian manages a quick peep inside the Minster, where they park whilst having tea. They arrive at the farm in the rain, and Marian is upset to learn that she will be sharing Jan’s bedroom. But next morning the sun is shining, and amazed by the setting of the farm, Marian longs to write poetry about it. She falls in love with the hills over the next few weeks. Uncle Geoff is a member of the local pot-holing club, and the next day the children accompany them on an expedition. The Thorpe boys are very interested, especially Will, who immediately decides that he will find an unknown cave, but Marian is not, and falls behind the party until they are out of sight, then wanders off on her own, enjoying the landscape and waterfalls. She hears music which thrills her coming from a cottage, and finds Mr Pickering playing his concertina outside it. He explains that he was playing a sword dance called ‘Lass o’Dallogill’, and that he and his wife have only lived there for a couple of years, before that they spent their whole married life in North Skelton. Marian, looking at their books, finds a bundle of swords, and Mr Pickering tells her that they are dancing swords, used for the North Skelton sword dance, and that he had danced it in the Albert Hall at the International Folk Festival of 1935. The other children find her there, and Mr Pickering tells them about the sword dance, playing them some of the tunes. The boys decide that they would like to learn the dance, and on their way home resolve to ask Mr Pickering to teach them. Mr Skelton takes the children out for a couple of trips in the car, to places of interest, but when Marian asks if they can go to Haworth, to visit the parsonage, her aunt tells her that there is nothing to interest little girls there, and that she has always thought that the Brontes lived an unhealthy, morbid life. Marian is determined to get there, however, and is still reading Emily’s poetry, although she doesn’t always understand it. The boys persuade Mr Pickering to teach them the dance, but although there are only five of them, and it is a dance for six, he refuses to let Marian take part, saying that it is a man’s dance, and a local boy from a neighbouring farm is roped in. Marian is undeterred, and watches all their practices, learning all the parts, and one day when Chicken is unable to attend the practice, she amazes them by stepping in and not making any mistakes. They adopt her as their mascot. The next excitement is when a cyclist, Mr MacVane, has an accident near the farm. The children rescue him and he is put to bed at the farm for a couple of days whilst he recovers. He hears the children singing the music to the sword dance, and when they tell him they are learning it, he explains that he is on the staff of the English Folk Dance and Song Society, and he was at the Albert Hall in 1935. He says that there is going to be a British Isles festival at the Albert Hall in September, and invites them to dance at it. They are worried about the expense, but Mr Skelton offers to pay for everyone involved to attend. Marian now plans her long-awaited expedition to Haworth, by bike, bus and foot, not telling anyone where she is going. There is a gale blowing on the moors, but eventually she makes it to the parsonage, and has the place to herself, the weather is so bad. She is naturally thrilled to be there, dreaming about the days when the Brontes lived, wrote and died there, but is brought back to reality when she finds her aunt and Jan outside, who have guessed where she has gone. They are surprised to find that Will is not with her, as he has also disappeared. Will has still not reappeared when they get home, and it is guessed that he has gone off looking for a new pot-hole. He had seemed preoccupied walking back from the last pot-holing expedition, and it would seem that he had found something. Teams go out looking for him, but there is no sign of him, and it isn’t till the next evening that Marian remembers finding a piece of paper with a rough map on it. Only she and Jan are in the house at the time, so they follow the map, and find Will who has fallen down the hole he has found and hurt himself. Marian goes down to keep him company whilst Jan goes for help, and the rescuers find that he has indeed found a new cave system. The sword team have been practicing, and eventually it is time to go to London. They have a night in Brighton first, then stay at a hotel in Kensington, near to the Albert Hall. All is going well until the last minute, when Chris John falls and twists his ankle. Marian immediately spots her chance, borrows a pair of scissors and cuts her hair to make her look like a boy, and begs to take his place. Eventually they agree, and she rushes back to the hotel to change into a shirt and shorts, like the boys’. The dance goes very well, and Mr MacVane congratulates them. Marian is surprised to find her father there too, and he takes her to see a play about the Brontes in the evening, instead of the musical comedy Mr Skelton had booked. Marian finds that she has enjoyed her summer more than she expected, and she has developed as a person, but she is looking forward to going home and having time for a long, uninterrupted read. 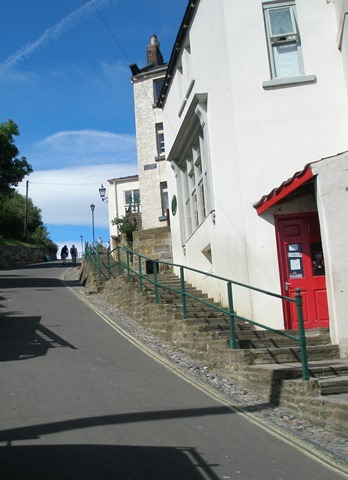 The book opens in Robin Hood’s Bay, on the Yorkshire coast. The village has hardly changed since MEA wrote about it, it’s very recognizable from her descriptions. 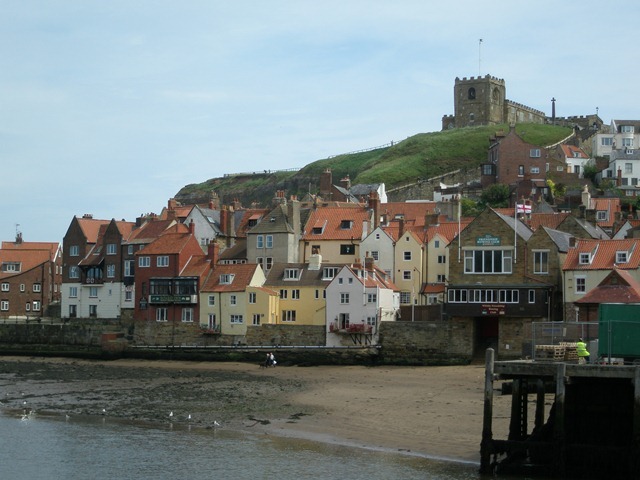 Marian takes the train to Whitby to gather her thoughts about the coming visit, she avoids the new town, and climbs the 100 steps up to the Abbey. I set Holiday at Arnriggs in Robin Hood’s Bay, because I loved it, and Arnriggs itself at the top of that high pass North of Wharfdale. On a road just off the B6160, there is a village called Arncliffe, the location of which seems to fit the location clues given in the text. There is a narrow gorge leading west from Arncliffe (p59). The road down the Dale (the B6160) takes you past Bolton Abbey (p80), and they drive to Ripon via Jervaulx Abbey (p96) (the unnamed road through Coverdale leads onto the A6108, past Jervaulx). 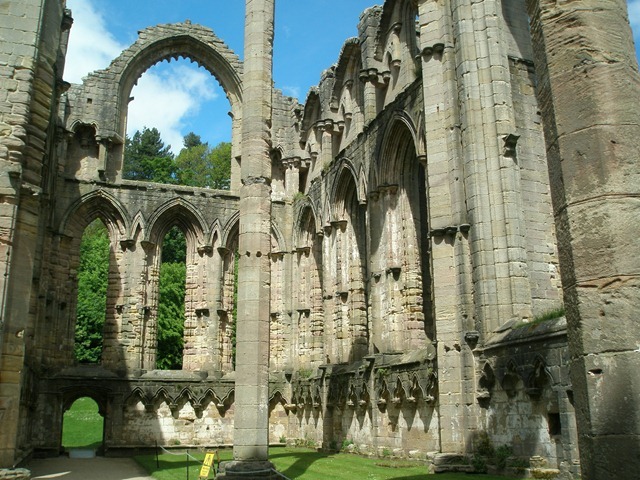 On days out they visit settle, Skipton, Ingleton, Ripon, Fountains Abbey and Bradford, although Fountains and Bradford are the only places that get any sort of description – Marian is predictably entranced by Fountains, only Gerald likes Bradford. 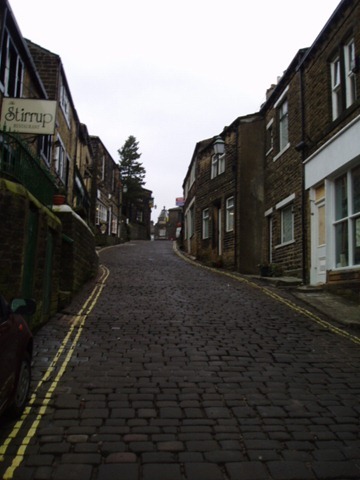 Marian visits Haworth on a stormy day, and imagines the Brontes walking up the steep main street. Later in the book they visit Brighton, although this is only reported, and we get no description, and the book ends with a visit to London, where they perform at the Albert Hall. The Thorpe children all appear to have been named for characters in the Robin Hood story, and Marian’s father calls her Maid Marian. They live in a house called Nottingham cottage, just to rub the allusion in further. The elder three Skelton children are very close together in age – Jan is nearly 13, and the twins are 12 at the beginning of the book, no wonder Chris John is only 9! Marian’s father is an artist, and Marian has obviously inherited his outlook on life, she feels that “her father was interested in ideas and in all sorts of odd and unusual viewpoints”, compared with the Skeltons, who are described as “materialists in every sense”, although they are kind. They were perfect material for dancing, and I produced some lovely teams for competitions….I had a boys’ sword team and taught them the long North Skelton dance with steel swords. They did the dance once in the great refectory of Chester Cathedral. In one of my very early books, Holiday at Arnriggs, a young team danced North Skelton in the Albert Hall. I can still cry when I read those chapters. I cried with excitement as I wrote them. It was perhaps the most wonderful thing that happened to me in those years. It is told about in my early book, Holiday at Arnriggs…. Not only was I getting to know my mother’s London at last, but seeing endless magical dance scenes. At the great reception at Lancaster House we drank claret under a summer moon. We danced in the parks and the grounds of Lambeth Palace, and we watched the foreign teams most nights in the Albert Hall. Reumania [sic] hadn’t been expected, but a team came. Very primitive male dancers, who had never left their mountain village before, it was said. (there were) dancers from every country, and they danced everywhere, even stopping the traffic in Piccadilly. There were great parties in Hyde Park and Greenwich Park, performances in the Albert Hall every night, and a last party in the gardens of Lambeth Palace. The dancing was advanced and very good, especially sword. George Tremaine played for sword on his melodeon…He was an ex-miner, and had played for a traditional sword team. The inspiration for Mr Pickering perhaps? 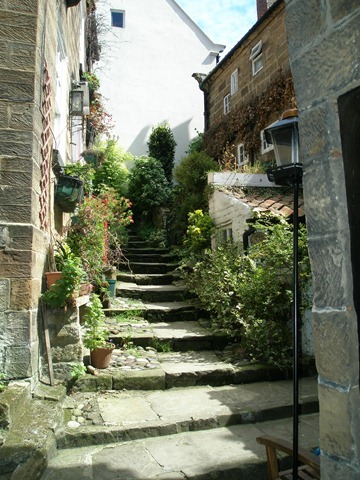 …Marion’s desire to go to Haworth was my desire, achieved by me in the mid-thirties, long before the village and parsonage was a real tourist haunt. It was easier then, in the bleak weather especially, to imagine what it was like for the Brontes. You can’t now, really. When houses become real museums, with strip lighting and central heating, visitors’ centres and parking for motor coaches, there is little atmosphere left. This is the first book I’ve read in this read through that reminds me why I love MEA so – probably because she is writing about a passion of hers, folk dancing, and her love for it comes through very clearly. The locations are also vividly drawn, making a memorable read. I also thrilled to the description of the sword dance! The play which Marian and her father see at the end of the book stars Mary Marraine and Mary Mortimer, from The Adventurous Summer. Jan Skelton is a pupil at the school Lucia attends in Lucia Comes to School. 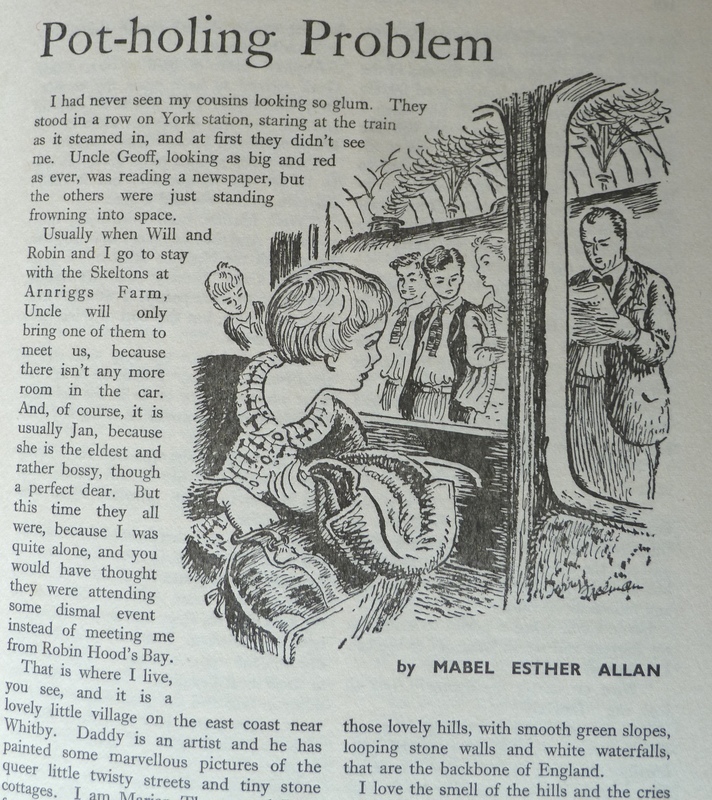 Marian and the Skelton family reappear in a short story, Pot-Holing Problem, published in Calling All Girls, and the Skeltons also turn up in Roaring Pot Adventure, published in For Every Girl. 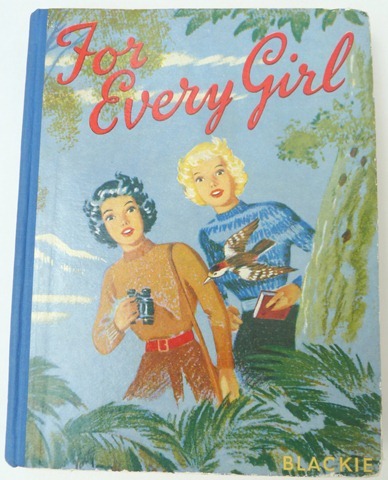 Both annuals were published by Blackie but sadly not dated, although I’d put them at 1950s. Unlike Holiday at Arnriggs, this story is told in the first person, by Marian. She has gone to stay with her cousins (her brothers have gone to a school camp for two weeks, but will be joining them later). The time is two years after Holiday at Arnriggs, and Marian, now 14, arrives at York to be greeted by her uncle and her cousins, who look very glum. On arrival at the farm, they tell her that their father has forbidden them to go pot-holing until they are grown up, as there has been an accident to a boy recently. In vain they have protested that he wasn’t experienced as they are. They persuade Marian to ask her uncle again, which she does, even though she doesn’t like pot-holing (although she has been down a few times). He still refuses, and they do some climbing instead. Several days later the members of the pot-holing club set out down Thunder Ghyll Hole in search of a new cavern, but disaster strikes when they get through to it, but then the passage leading to it collapses, trapping several members of the club, including Mr Skelton. There is another way though, but it is too small for the members of the club to attempt, so they ask the children to try it, to warn the adults to stay away from the collapsed part, as they are going to blast their way through. The children, including Marian, manage to get though, and give the warning, and the men are rescued safely. After this Mr Skelton reluctantly agrees that the children can go pot-holing again. This is a pleasant story, and it was nice to meet the characters again, but it suffers slightly from being written in the first person – it’s a bit self-conscious in places, as the teenage voice in stories tends to be. Marian is still reading Bronte poems – it’s a shame she hasn’t moved on in two years – and still doesn’t crave adventure in the same way as her cousins. The heroine of this story is Sabrina Grey, who has moved to Arndale with her parents. 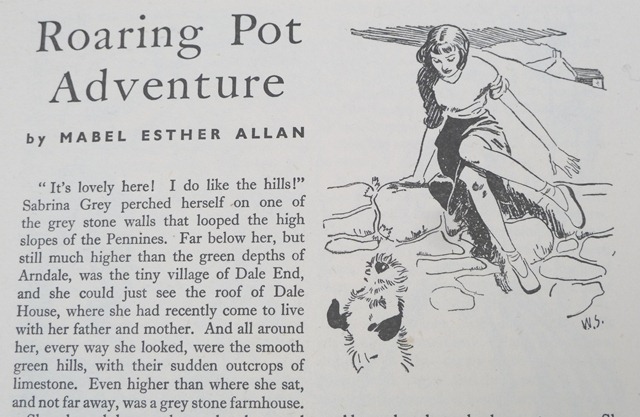 She meets the Skelton children when their dog, Lucky Dip, chases her, and they try to tell her about the pot-holes in the area, but she tells them that she not only knows about them (her father has bought her a guide book) but that she has found a previously undiscovered pot. She refuses to tell the Skeltons where it is, but eventually agrees to take Jan, although she insists on blindfolding her so she doesn’t find the exact location. 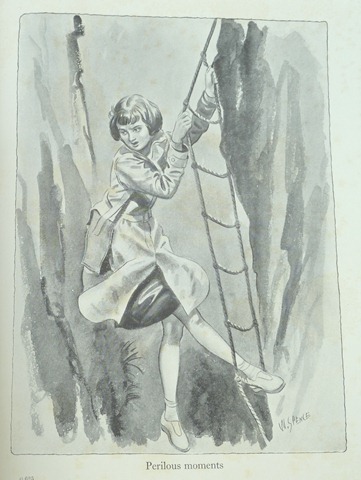 On her next visit to the pot, alone, her rope breaks, but Jan finds her (having noted the direction of the wind on her face when she was being led there previously, and dropped shells to mark the way) and rescues her. The pot is then explored by the pot-holing club. In More About Being an Author, at the very end, MEA is reflecting on the experience of rereading her own books, and says, “I never could forget Holiday at Arnriggs, because of the North Skelton sword dance that runs all through the book, but I certainly had forgotten that I had written a short story about the characters until it turned up in an old annual.” She evidently found the other story later on, as it appears on a list she made of her short stories. All photographs in this post are from my own collection.